I was born in 1965, Christopher Ure Jamison. I grew up on a dairy farm in Bullville (or Thompson Ridge, if you prefer) in the Town of Crawford, Orange County, New York. 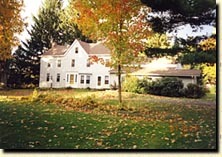 For several years my parents ran the house as the Milton Bull House bed and breakfast. Now they are retired from the B&B business. I attended Pine Bush High School, graduating in 1983. I attended college at Rensselaer Polytechnic Institute (RPI), graduating with a BS in Computer Science in 1987. Over the summer of 1985 I worked as an intern at Walden Federal Savings and Loan Association. In 1987 I graduated from RPI and went to work for First Federal Savings and Loan Association of Middletown, NY. My dad is currently chairman of the board at Walden Federal . In 1989 I went to work for SE Technologies as a software consultant. I have a CPIM from APICS (1992), and work with manufacturing companies in all industries. I spent the winters of 1989-1990 and 1990-1991 living in Milton Keynes, England and Dunfermline, Scotland. I met and in 1992 married Linda Bergin, of Walden, NY. Linda graduated in 1988 with a BFA from SUNY, Fredonia . Linda worked for Orange County Social Services and The Disney Store . Our daughter Claire was born in 1995. We all moved to the Atlanta , GA area in 1995. Our son Alexander was born in 1997. In 1998 we bought a house in Duluth, GA. We currently attend Grace Christian and Missionary Alliance Church in Norcross, GA. Grace is a CMA church. What does the CMA logo mean? Find out. Also in 1998 I changed companies to work for Quality Consultants (QCI) as a Baan implementation consultant. In 2000, QCI merged with Red Klay Solutions to form Red Klay Web Solutions . Linda is currently an associate with Mannatech , a distributor of nutritional supplements. In March, 2000, our son Samuel was born. In 2002, my company merged to become Fullcope. At about the same time our four child, daughter Genevieve, was born.